The number of creatures in a kelp ecosystem is extraordinary. Corallines, a branching coral like seaweed, may incrust every frond and leaf; cuttlefish dart in and out; multicolored ascidia, tiny invertebrate filter feeders, dot and cling to the waving leaves. On flat surfaces you find sea snails, limpets, mollusks, and bivalves. Permeating this undulating landscape, attached or unattached, you may find krill, shrimp, barnacles, woodlice, cuttlefish, and crabs. Sea urchins will be gnawing away at the stems, and wolf eels, starfish, and triggerfish will feed on them. Among them all will be tiny forage fish, the smelt, halfbeaks, and silversides. And circling the waters around the dense kelp growth, shimmering game fish will feed on the prey fish. Once a systems engineering consultant, Brian Von Herzen now devotes his life to reversing global warming by restoring the primary production of oceans, using kelp and other seaweeds. Primary production is the creation of organic compounds from carbon dioxide through photosynthesis. Oceans face a dire situation. They absorb half of the carbon dioxide recaptured from the atmosphere, which causes acidification, and over 90 percent of the heat from global warming. Ocean deserts are expanding. Von Herzen wants to restore marine life in subtropical waters with thousands of new kelp forests—what he calls marine permaculture. The key technology involves marine permaculture arrays (MPAs), lightweight latticed structures roughly half a square mile in size, submerged 80 feet below sea level, to which kelp can attach. Attached buoys rise and fall with the waves, powering pumps that bring up colder, nutrient-rich waters from far below. Kelp soak up the nutrients and grow, establishing a trophic pyramid rich in plant and animal life. Plants that are not consumed die off and drop into the deep sea, sequestering carbon for centuries in the form of dissolved carbon and carbonates. Floating kelp forests could sequester billions of tons of carbon dioxide, while providing food, feed, fertilizer, fiber, and biofuels to the world. NOTE: This piece was written with input from Brian Von Herzen of the Climate Foundation (http://www.climatefoundation.org). “these great aquatic forests”: Darwin, Charles. The Voyage of the Beagle: Journal of Researches into the Natural History and Geology of the Countries Visited During the Voyage of H.M.S. Beagle Round the World. New York: P. F. Collier & Son, 1909.
nature…subordinate to human alteration: McKibben, Bill. The End of Nature. New York: Random House, 1989.
the Anthropocene: Carrington, Damian. “The Anthropocene Epoch: Scientists Declare Dawn of Human-Influenced Age.” The Guardian. August 29, 2016.
primary forest in Borneo: Myers, Norman. The Primary Source: Tropical Forests and Our Future. New York: W. W. Norton, 1984. “We are growing water”: Life in Syntropy. 2015. Vimeo video. Agenda Gotsch. https://vimeo.com/146953911. heat…absorbed into the surface waters: Rhein, M., S.R. Rintoul, S. Aoki, E. Campos, D. Chambers, R.A. Feely, S. Gulev, G.C. Johnson, S.A. Josey, A. Kostianoy, C. Mauritzen, D. Roemmich, L.D. Talley and F. Wang. “Observations: Ocean.” In Climate Change 2013: The Physical Science Basis. Contribution of Working Group I to the Fifth Assessment Report of the Intergovernmental Panel on Climate Change. Cambridge, UK, and New York: Cambridge University Press, 2013.
annual decline in…plankton and kelp: Boyce, Daniel G., Marlon R. Lewis, and Boris Worm. “Global Phytoplankton Decline Over the Past Century.” Nature 466, no. 7306 (2010): 591-596. Given that Hurricane Katrina alone cost $108 billion and that 2015 saw twenty-two Category 4 or 5 hurricanes, this may be a cost-effective solution. Small-scale ocean farms have the potential to provide sustainable food and biofuel, while oysters filter nitrogen pollution and seaweed sequesters carbon dioxide. 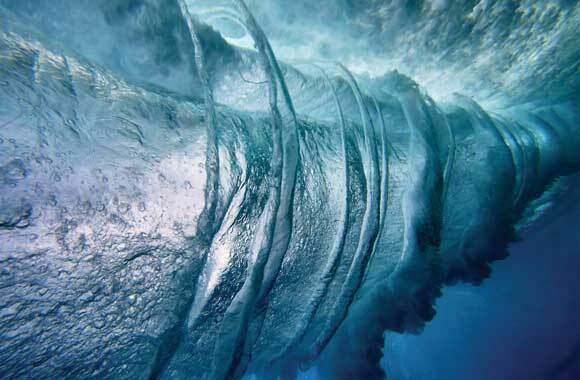 Solid-state wave energy technology converts the ocean’s kinetic energy without external moving parts. It is more robust in marine environments, rich with untapped renewable energy. Wave- and tidal-energy systems harness natural oceanic flows—among the most powerful and constant dynamics on earth—to generate electricity.